Hope for this country. Hope for our future. 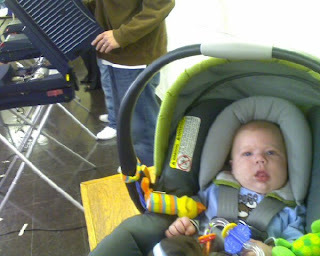 Hope for Carter, who, although he can't drive yet, still got out and voted. I feel different today then I did yesterday. Can you feel it? I think it's the hope and anticipation of change; something that this nation so desperately needs. I'm happy that I am alive today and was able to be apart of such a historical election. It was amazing to see the number of people who went out and voted yesterday. Truely amazing. "As Lincoln said to a nation far more divided than ours, 'We are not enemies, but friends... Though passion may have strained, it must not break our bonds of affection.' And, to those Americans whose support I have yet to earn, I may not have won your vote, but I hear your voices, I need your help, and I will be your president, too." WOOOOOOO! im so excited. OBAMA! This quote gives me chills. I feel differently too. It is a feeling I haven't felt in a very long time. Hope. Change is here.